The title of this blog post is very generalised. Whether you've moved to a new 'country', or a new town, moving somewhere you don't know anyone is daunting. Moving away from people you love means finding a new support system, because the people around you are, in all honesty, what keeps you sane in life. They're the ones who stop you calling your ex at 3am and help you eat a tub of Ben and Jerry's during titanic, they look after you on nights out and stop you feeling 2/10 when you don't get a second date. But without school, or college, or uni, how on earth do you meet people when you go to a new place? How do you naturally make conversation happen, so you find your people? The truth is, it's difficult. But if I've learnt anything from the time I literally leaned over a table in Italy because I heard four girls speaking English and half-begged them to take me under their wing, (the words 'I have no friends here' were mentioned at least twice), it's that you need to be brave. Moving to the opposite side of the world? No problem. Making friends in said location? No thank YOU. People have a fear of approaching those they don't know. It's a natural fear of rejection, but the truth is, if you're not being creepy and the people you're approaching are nice, then it'll be absolutely fine. And you've got to think, would you really want to be friends with the kind of people who do reject you? All you really need to kick off a friendship group, is one key pal who has friends too. Most of my friends in Australia have been met through friends of friends. My best friend in Italy was also met through a friend. If you have someone to help you connect with people, making new friends can be easy. BUT, what do you do when you literally don't have a single friend? Not one human being in the vicinity to depend on? This is where, in my opinion, you use an equal measure of common sense, friendliness and technology. Facebook groups are your new best friend. There's honestly a Facebook group for everything these days. Write a friendly post saying you're new to the area and keen to go for drinks, honestly, like minded people will jump at this. Use your common sense to accept messages from people you would probably like to hang with, and filter the inevitable creepy ones too. And be brave enough to take the step and meet up with them. Lydia, the girl I'm running hand and hand with into the sea in this blog's photo - we met in a Starbucks after messaging on Facebook. Stranger danger is real, but if you're sensible, you can absolutely use it to your advantage. If you've travelled to a new country as a backpacker, you might find meeting people face to face easier than online. Hostels are a great place to meet new people, you just need to be brave enough to talk to strangers over washing your underwear in the sink. 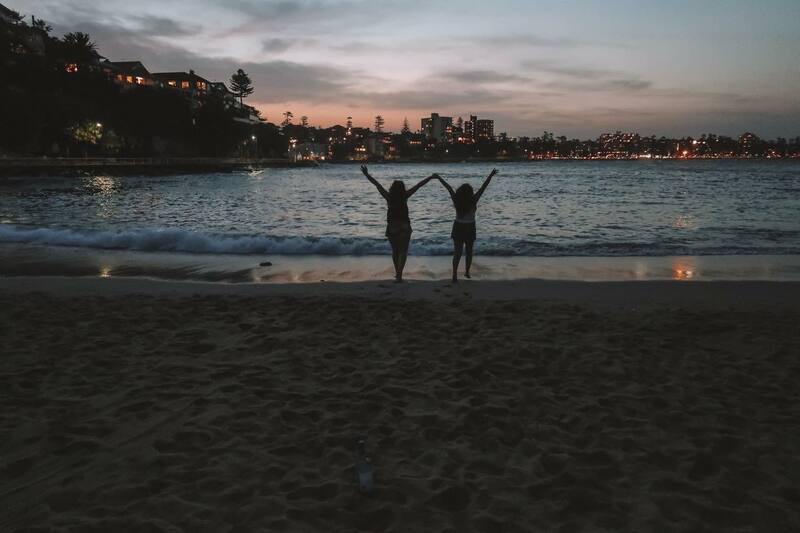 Hostels are also great because there's a lot of individuals passing through all who have got the same desire to travel as you, and some hostels will have events for you to join in on if you want to - another ideal way to make friends! The truth is, meeting people depends on two things, being brave and being friendly. Trying to make friends is so daunting, especially as an adult, you feel like you're being thrown into year 7 at school all over again. But if you put yourself out there, and manage a smile, you should be able to meet people even in the smallest of places. I hope you've all had wonderful weekends! This is the true, friends and fellowship is a life, cuz when you are alone it's not tasty even to eat an ice cream). Sometimes fate makes unusual surprises such as a friend or girlfriend who looks like you in character, who understands you and is just as lightly crazy as like you.